Sergio, Julian, Manoj, Thomas and Kim were best friends. Now they are Brewdaz. How did this happen? The story began on a lovely late summer evening on a terrace. Everything was perfect: The bratwursts, the music and the good company. Only the beer tasted like wet cardboard. Kim was raving about his 20L homebrew equipment and everybody was all ears. He reported of a mysterious fallow ground where one could obtain space for innovative projects which started the ball rolling. 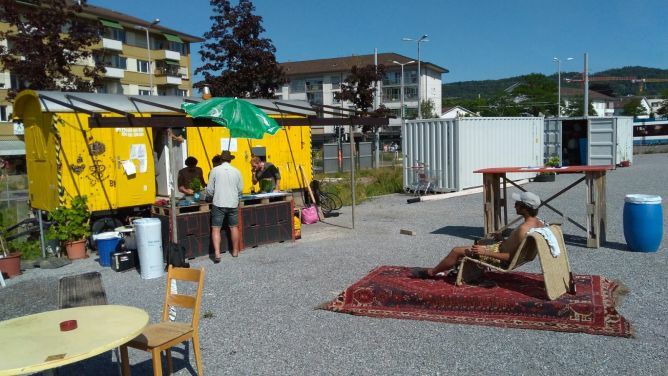 One month later our own Beerwagon obtained from Walo was placed on the fallow ground Guggach right in front of the SRF radiostudio. Two years passed by since then and the initial 20L set up with the five friends grew into a Brewderhood (club) with one aim: Break all beer boundaries and develop new beer sensations for daring palates. 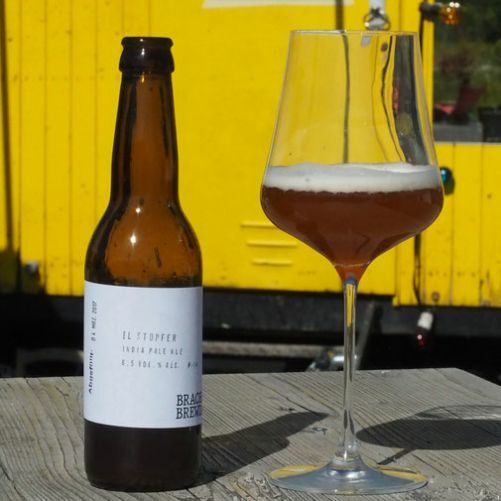 Now you have the unique opportunity to support us in our new project: Our own brewery! 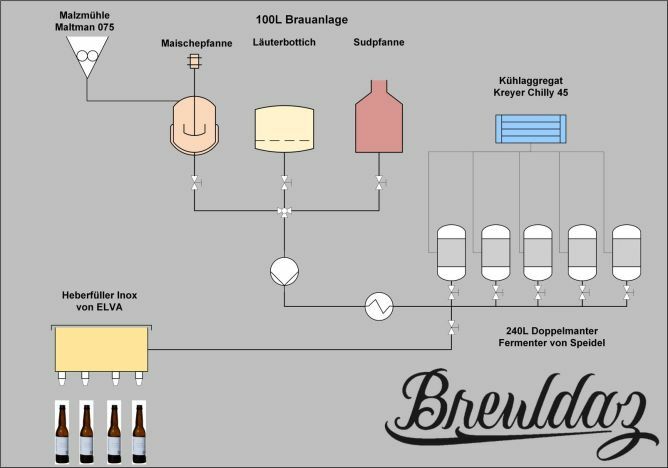 Visit us on www.BREWDAZ.ch and get additional information on our brewclub and our beers. Why should I drink BREWDAZ beer? 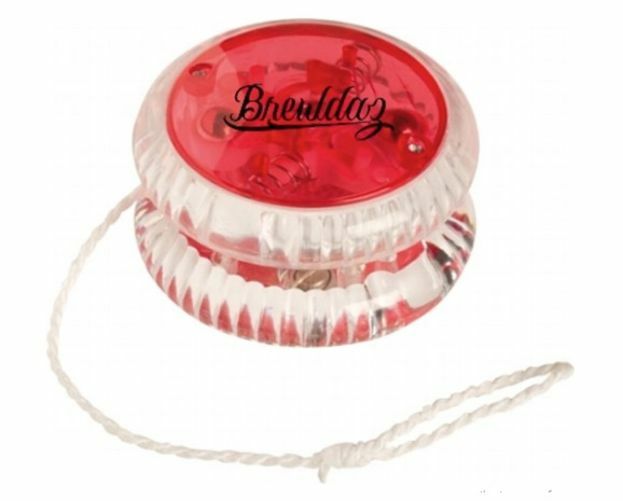 BREWDAZ beers are known for their originality and way of production. Each beer has its own story and represents an evolution process between brewer and beer. Several batches are required until a beer reaches the desired taste. Sometimes it works the other way around, and the beer forms the brewer to its taste instead. For example the Hippiekuss. We intended a pale ale with hints of dragon flower. 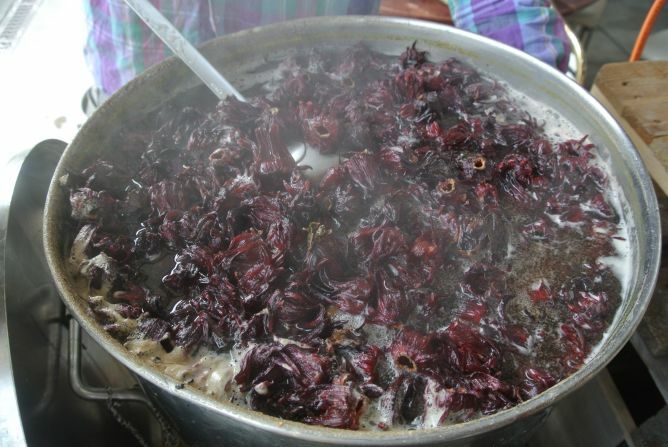 However, by a misunderstanding a way to high amount of dragon flower was thrown into the brew kettle. Instead of the slight hint of dragon flower we created a dragon flower massacre in our noses. Love at first sight. In a second stage we decided to substitute the ale yeast with a lambic blend. This blend contains besides classical ale yeast other types of microorganisms: Wild yeast (Brettanomyces strains), lactic acid bacteria and pediococcus. This potent blend could hold up with the strong dragon flower aroma and enhanced the overall complexity of the Hippiekuss. Furthermore, the lactic acid bacteria give the beer a nice sour palate. In a collaboration with «ValeFritz» and his pop up series «WoodFood» we created a special edition of the Hippiekuss: The WoodBrew. 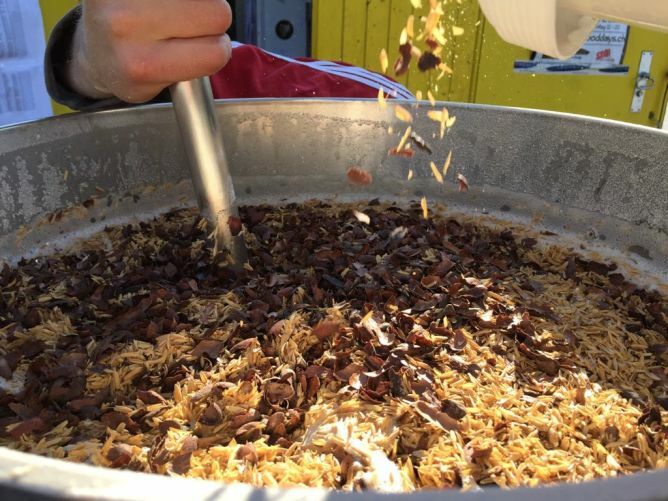 We added roasted flakes of swiss pine to further aromatize the beer. Imagine yourself pouring your guests a nice Hippiekuss alongside with an Apero out of an 750ml Champagnebottle! Or walking down into your beer cellar on a cold winter day and discovering that you still have some last year imperial stout left which you will savour in front of your chimney! Our dream - your support! 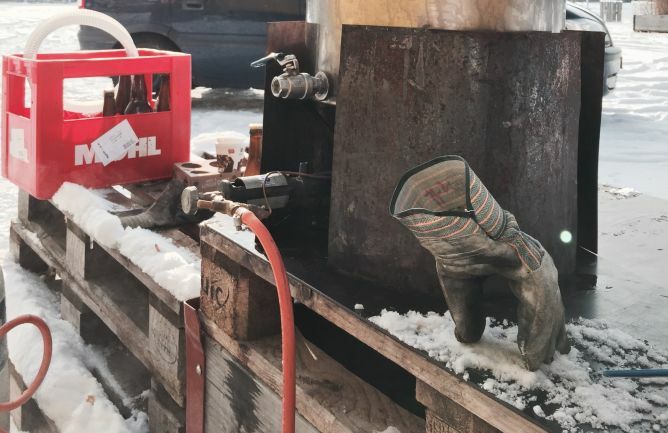 It dawned on us during an icy (-8°C) brewsunday when our water hose froze completely before we even saw a single drop of water coming out: We need a brewery and we need it before winter comes! January 2018: We found an AG. For this we need 50’000 CHF on a banc account. 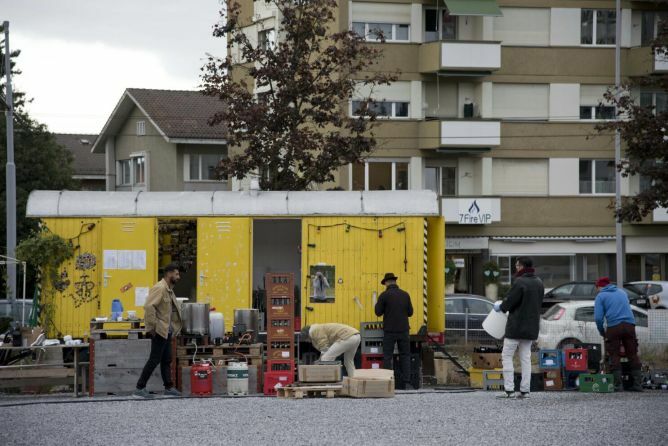 The 50’000 will be gathered by the crowdfunding money, the money from our brew club and our personal money. February 2018: We sign the rental contract for the 200m^2 commercial space next to Hardplatz. Equipped with heavy current, floordrains, water pipes and ventilation we are ready to brew. The rental deposit amounts to 13’200 Fr. February/March 2018: The BREWDAZ lay hands on the new site in order to meet with the current legal regulations. Corners are smoothed out so that no grain of dust may survive the cleaning of the floors and so on. March 2018: We install the new 240L double jacketed Speidel fermenters. Each fermenter is regulated via a thermometer which connects to a magnetic valve. As soon as the temperature rises, the valve pops open and cold water rushes through the double jacket. April 2018: Julian will be contracted as brewer. He is going to brew and distribute the beer. Bottling will still be performed by all BREWDAZ during the weekends. Mai 2018: We inaugurate our brewery together with all our backers. This hopefully includes YOU! FAQ: How do I get my rewards? 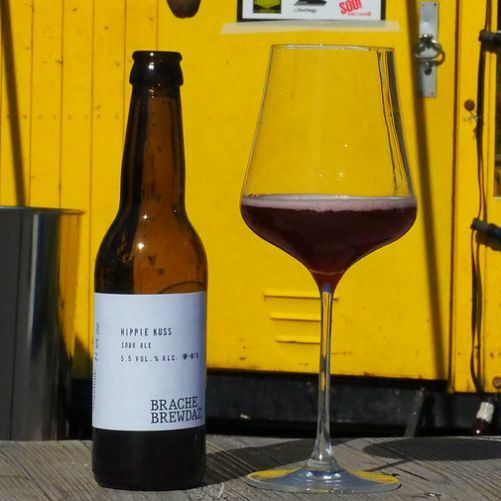 If shipping is not included in the reward, you must pick up your rewards at either our brewing wagon next to tramhaltestelle Radiostudio or at our new location right at bushaltestelle hardplatz. You will be informed about the dates and times. Of course we are able to send you the rewards but in said case we have to bill you the shipment. If you purchase «Brew with the BREWDAZ», «Brew with a friend», «BREWDAZ express», «BREWDAZ Party», «Corporate brewing workshop» and «BREWDAZ ultimate» we will send you a voucher by postal services or Email, so that you will receive them before christmas if possible. FAQ: When do I get my rewards? All non beer rewards will be delivered/manufactures as soon as possible. We plan on deliver the beer rewards from May 2018. FAQ: How long can I keep the beer? 12 Months from bottling date. Dark varieties and sour ales can be aged longer without problems. BREWDAZ [bruːdæz] or [bruːdəz] is the fusion of«brew» and «brothers». 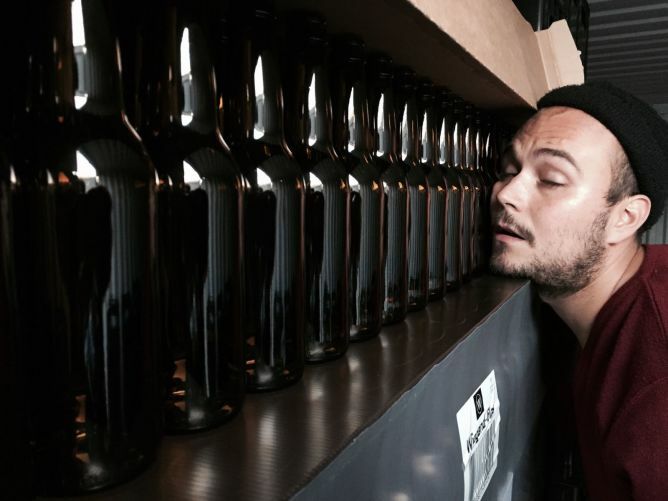 FAQ: There exists too much craft beer already! Why shouldn’t I buy a Chopfab instead of supporting you guys? There is never enough beer. We don’t brew craft beer we brew BREWDAZ beer. Chopfab is nice too. Try the «trüb». 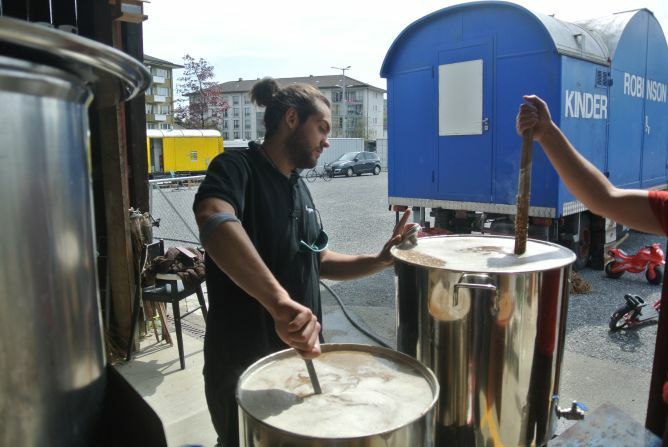 FAQ: How many Liters of beer are you going to produce monthly? We aim at 1000L per month. FAQ: In the Cost calculation (picture below) the pump, heat exchanger and brewing house are not listed? The brewing house is kindly provided by a benefactor. We already have a pump and a heat exchanger. 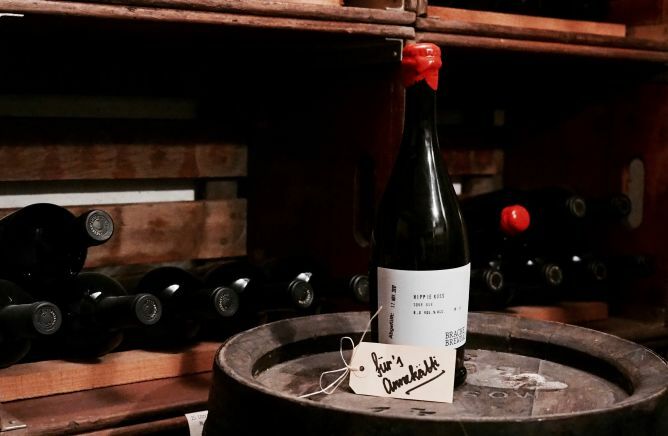 FAQ: How are you going to bottle and label? All by hand. All by hand. Still have questions? Write us an email to contact@brewdaz.ch or just post a comment. We are thankful for all kinds of inputs. This project ended successfully on 17/12/2017 12:00! Every franc counts. Thanks a lot for your support! You get a kiss by a BREWDAZ of your choice. Has to be claimed at our beerwagon or brewery. The money gathered with this reward will be set on red in a Roulette game. If we win, every supporter in this category gets a free beer! At our next brewday we will shout your name into our brewing kettles, to embed your spirit into our beers. As proof we will post a video on our website. Come to our brewery and drink a beer of your choice followed by a warm hug of us. Has to be picked up. Do you remember your old Jojo? Buy now a BREWDAZ Jojo (see picture) and show who the daddy is! Incl. shipment. Become a member of our club and get a free beer after signing the membership. As member you will get an exclusive invitation to the opening party of our brewery and other BREWDAZ events. Has to be picked up. You get two cups with the BREWDAZ logo so that you can marvel at the beer colour while your drinking our beer. Has to be picked up. All good things come in threes. Choose 3 bottles out of our beer selection. Has to be picked up. You receive a VIP pass for a BREWDAZ party of your choice. You will never have to queue in a line and will be adressed with "sir". You've got the money and we've got the style. 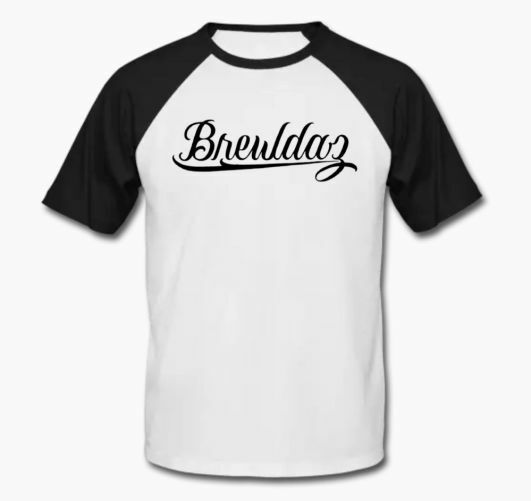 Get your BREWDAZ-shirt in the size of your choice (S-L). You can choose between two colours as displayed in the pictures. Incl. shipment. Get your 750 ml beer in a champagne bottle (see picture) for special moments and with a personal dedication. Get six bottles of BREWDAZ beer of your choice. Drop in at our brewery on a prescheduled day and taste all our beer varieties. We will give you a small tour and tell you how to savor best our beer. Hotter than the Pirelli calendar, profounder than a John Lennon song and lots of waggishness: Get the first edition of the BREWDAZ calender! Because you don't give a f..
Show other people that money is not an issue for you! Get your beer crate (24x33cl) of BREWDAZ beer, which you pick up at our brewery. Visit our brewery and learn the art of brewing beer. The brewing course takes 5h including food. On this day you drink as much beer as you want. You receive every second month a six-pack of BREWDAZ beer for one Year including shipment in Switzerland. Visit our brewery with a friend and learn the art of brewing beer. The brewing course takes 5h including food. On this day you drink as much beer as you want. Party? Apero? Corporate event? We deliver the beer. 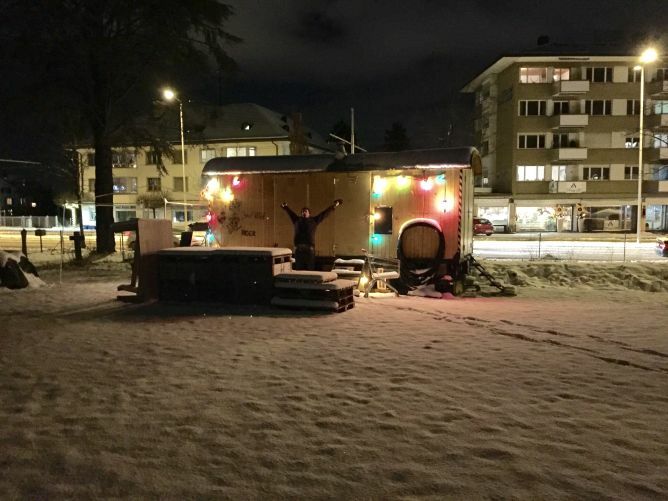 Get 3 crates of beer (72x0.33L) delivered to an address within the canton of Zürich. You might as well order even more beer which we would be glad to deliver. Are you a bar or pop-up? We have got the good stuff for you! We will label 50L of beer with the name of your choice and deliver it to you. The beers you can choose of are listed on our website www.brewdaz.ch. You receive every second month a crate (24x0.33L) of BREWDAZ beer for one Year including shipment in Switzerland. Throw your private party at our brewery (max. 30 pers.). 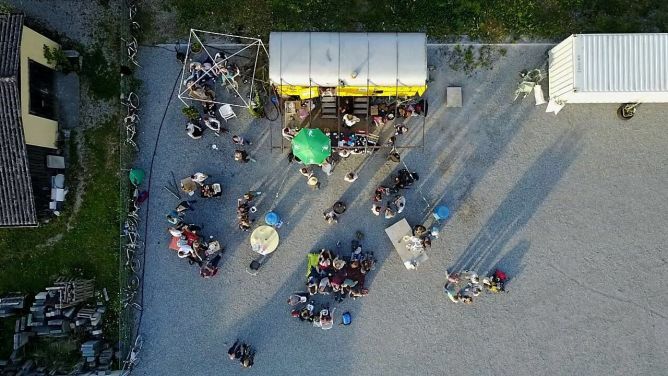 Good beer (30L), snacks, grill and music are all organized by us. Stay at our brewery and drink with up to 30 people for free until your contingent of 30L is finished. You will be served "Currywurst" with a homemade sauce. Not the sausage kind of type? For vegetarians we serve "pimp your corn", grilled corn cobs with different toppings. A perfect start into the weekend. Cheers! Stay at our brewery and drink with up to 30 people for free until your contingent of 30L is finished. Not only will you drink excellent beer but also will you be served exquisite amuse-bouches. You may choose 3 vegetarian and 2 meat varieties: Vegetarian: bluecheese- radicchio- walnut- focaccia, caramelbutterfoam- radish- Zopf, roastedcaulyflowercream- almonds- Trevisano, cucumber- dillfoam- hazelnut, boletus- Kernotto (spelt-barley), caramelized carrot- onionash- Salattaco, deepfried brussel sprouts- parmesanmayo. Meat: 54°C Beef- gralicash- thymeemulsion, Chickenskin Popcorn, Smoked arctic char- lemonmayo- Salattaco, bacon- pecorino- walnut- focaccia. Additional vegetarian amuse-bouche: 100 Fr. Additional meat amuse-bouche: 150 Fr. Looking for a corporate event or a team building seminar? 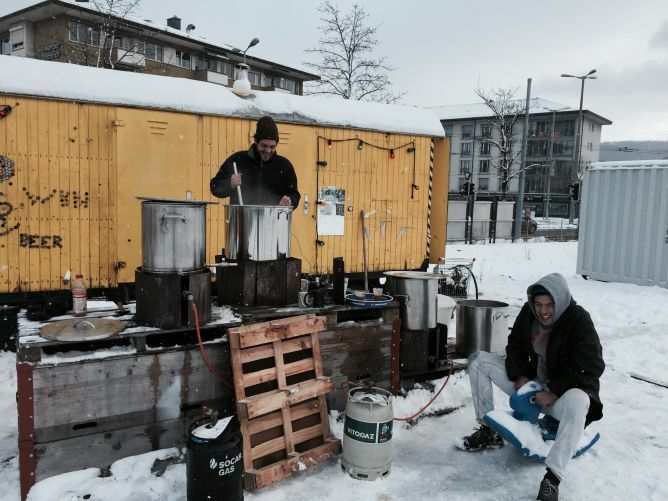 What better way to do so than brewing your own beer? In this 5 hours workshop you and your team of max. 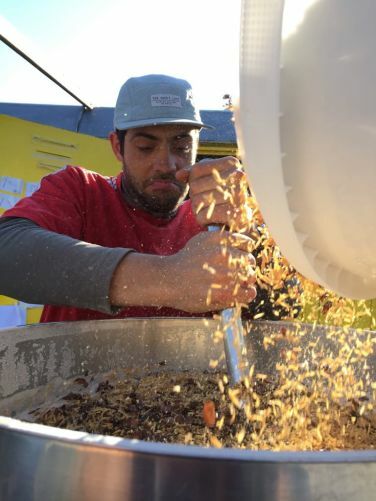 10 people will learn how to make your own batch of beer from grain to bottle. Not only will you brew your own beer hands on, but also will you learn about the theoretical background of beer. What is malt? Which yeast strains exist? Furthermore, we will serve you a nice lunch followed by a tasting of our beers. At the end of the workshop, all participants receive a six pack of beer and a brewing certificate. The ultimate brewing experience for up to 10 people. Create, name and brew your own beer with our brew master. You will meet with our brew master to learn about the basics of brewing in order to create your own recipe. In a second step, you will brew your recipe in our brewery. The ingredients, tools and know-how will be supplied by us. 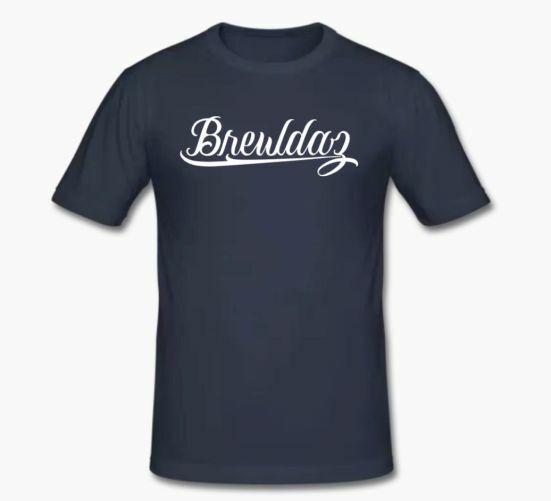 At the end of the brewing day you will be rewarded with a beer tasting, a certificate and a BREWDAZ shirt. Once the beer is ready for consumption, you can invite your friends (up to 30), to eat at our brewery and drink your own beer. What is left of your own 120L batch you can take home of course. Jorim is writing his master thesis on neuronal networks. 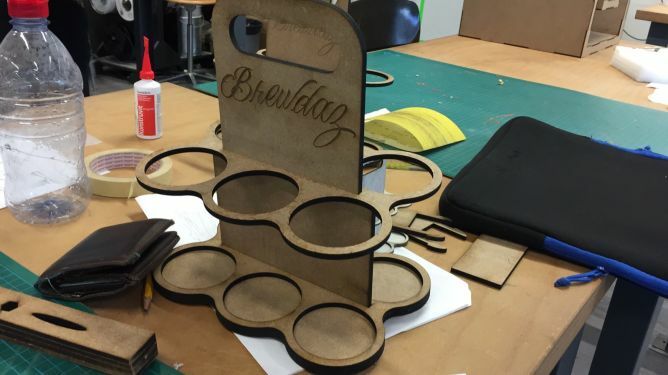 Once he has finished he will dedicate his time to develop the BREWDAZ app, which always keeps you informed. Sergio is a visionary with incredible convincing powers. 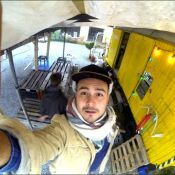 His caleidoscope of skills includes music, electric circuits and automation and marketing. Needless to say that he made our website and teaser. If he is tired of hanging out with the BREWDAZ he works as an eventtechnician at Zürich Insurances. 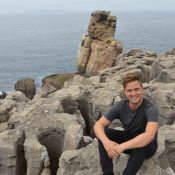 Kim studied Food Science at ETH and worked in a brewery in Lima (Cerveceria Nuevo Mundo). He ensures that cleaning protocols are followed and general quality management. Furthermore, he adresses process engineering questions regarding the brewing process.